DOWN TIME you're most costly hours. 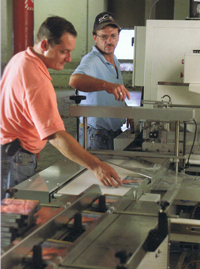 Brown Packaging is dedicated to minimizing customer down time! The PMP program is just one example of our customer oriented thinking. With this program, materials customers can opt for preventative maintenance calls as required one or more per year. Like just before their busy season, getting everything in peak operation helping to insure maximum output when required. Many use our service to help with the training of new employees or when transfers from other departments are put into new responsibilities. Our goal is to transfer knowledge that will keep your plant running efficiently. To that end, we are committed to you as part of our "Total Package" support program.